Cheap last minute flights from UK to Mexico from Ł209 (€251)!! AirAsia BIG sale promotion – 20% discount on all flights to all destinations! Cheap flights from UK to USA – London to New York Ł301 (€362), Los Angeles Ł381 (€459)! Flexible travellers looking for exotic but cheap holiday destination in Caribbean may consider current offer of a last minute flights from various airports in UK to Cancun, beachside city in Mexico. The cheapest flights are available from just Ł209 (€251) when departing from Birmingham. In case of departing from Manchester you may purchase the flights from Ł249 and London from Ł279. As usually only few travel options are available. Below please find currently the cheapest airfare possible ex each origin city in UK. Birmingham – 13. – 29.3. Manchester – 25.3. – 11.4. London – 11. – 18.3. Do not forget that Thomson Airways are low-cost charter provider – only hand luggage up to 5kgs is included in their base fare. Checked in luggage up to 20kgs would cost additional Ł75 per piece. Booking has to be done directly with Thomson Airways. This UK carrier is also offering this promotion code to further discount your flight. Cancun is of course offering more than just amazing sand beaches in Carribean. 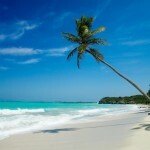 For instance you may visit Puerto Morelos which is a friendly, laid-back fishing village located only 35km from Cancun. The tranquil atmosphere attracts people from all over the world, many of whom have chosen to make it their home. You will be seduced but its natural beauty and charm which transport you away from the glitz and glamour of Cancun. The coast surrounding Puerto Morelos is part of the National Marine Park making it ideal for scuba diving and snorkeling. Booking sample of a cheap last minute flight from UK to Mexico for just Ł209 (€251) below. In this case you would be departing from Birmingham to Cancun on 13th of March and returning to UK from Cancun on 29th of March 2014.